The jaw-dropping splendor of the Duomo’s façade is perhaps the most iconic view of Milan, but it’s not the only memorable one. 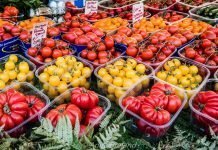 When my husband and I visited the city in November, we spent a half day walking the streets of a Milan I had not known existed. Our made-to-order tour, with an emphasis on nuggets of local history, was a brisk and companionable ramble through Milan’s southwest quarter. 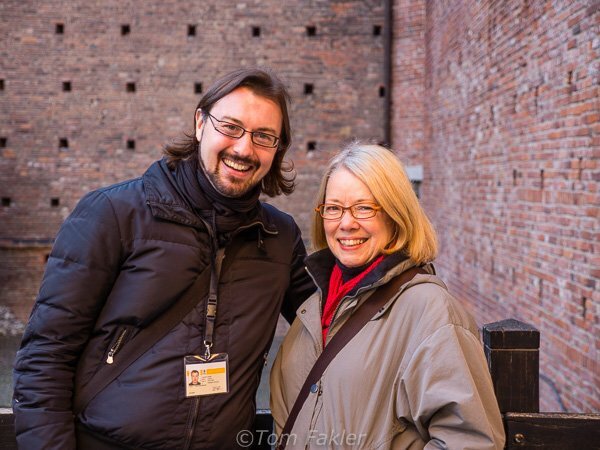 When Walks of Italy offered to show me and my husband around Milan, we jumped at the opportunity to learn some city history our favorite way–on foot. 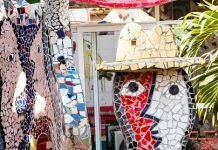 We saw traces of the city’s former canal system, walked a street named after Milan’s operatic super-star, and visited a sweets shop reputed to brew the best espresso in town. Highlights of the day: an introduction to Milan’s patron saint, a stop to see Michaelangelo’s last work in a castle museum, and a visit to a cloistered Renaissance convent for noble ladies. 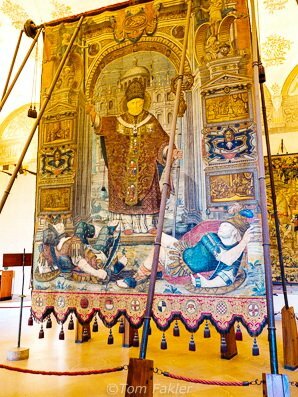 Christendom was a wild and crazy place in the 4th century, and in 374, Aurelius Ambrosius, or Saint Ambrose, was named Bishop of Milan at the ripe age of 34. An eloquent diplomat, he repeatedly intervened as a peace-keeper in disputes, and wielded considerable power with the Emperor Theodosius I. 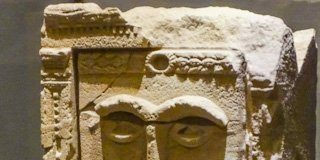 He became one of the most influential ecclesiastical figures of the 4th century, a time when the lines between political and religious boundaries were particularly fuzzy. One of the four original doctors of the Church, he baptized St. Augustine. Legend has it that bees swarmed to the honeyed voice of St. Ambrose, who is also the patron saint of beekeepers and honey makers. His feast day, 7 December, is a major holiday in Milan. There is not much to see of St. Ambrose’s original church: centuries of power play and Allied bombing during the Second World War saw to that. However, what remains tells quite a story of Milan’s history, from architecture to church politics (as in sparring monks and canons). There are more dramatic religious buildings in Milan–the stunning Duomo, for one–but only one spot marks the beginning of Christianity here. 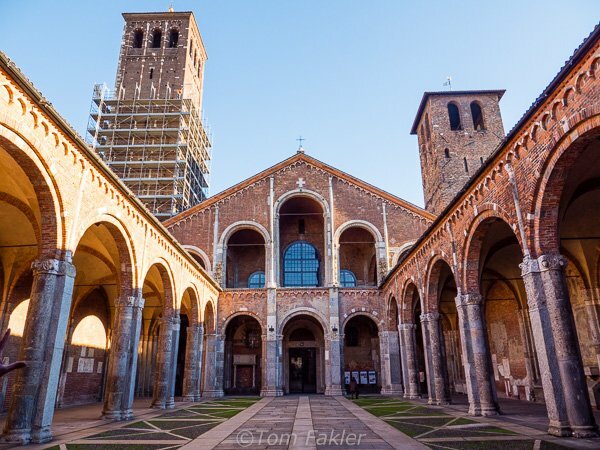 Basilica di Sant’Ambrogio is a wonderful start to an exploration of historical Milan. The original church was built atop a pagan cemetery, incorporating gravestones from the “holy fields”. At Basilica di Sant’Ambrogio, the south tower, or Monks’ Tower, was completed in the 10th century; the north tower, or Canons’ Tower, almost two centuries later. 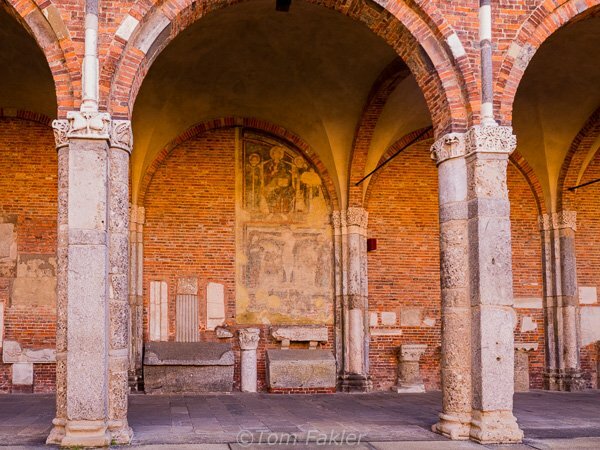 Sant’Ambrogio’s masterpieces include the San Vittore mosaics and the Golden Altar. The altar’s shelter, the Ciborium, is decorated with Byzantine Lombard stucco work, and supported by ancient Roman columns. 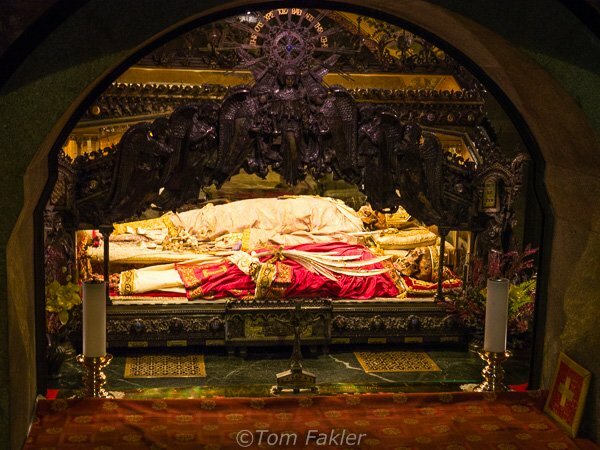 Continuously venerated, Saint Ambrose’s body is said to be one of the oldest extant bodies of historical personages outside Egypt. 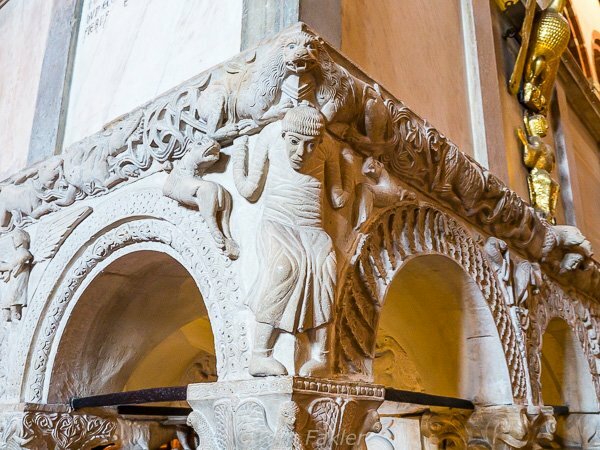 See more images of Sant’Ambrogio and get details for visiting from Milan Tourism. 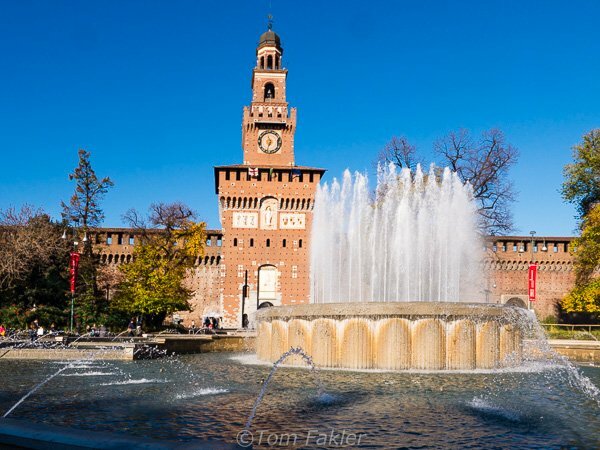 Castle Sforzesco (Sforza Castle) is a popular tourist destination, easy to get to on public transportation, and home to several important civic museums. 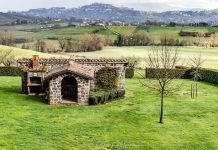 It began as a fortress, built along Milan’s medieval walls by Galeazzo II Visconti. The fortress was constructed of bricks, the traditional building material for residences of the time–obscuring the fact that it would actually be a fortress upon completion. The castle was named after Francesco Sforza, who transformed it into a ducal residence in 1450. Demolished, rebuilt, embellished and restored–Sforza Castle became Milan’s castle of culture at the beginning of the 20th century. 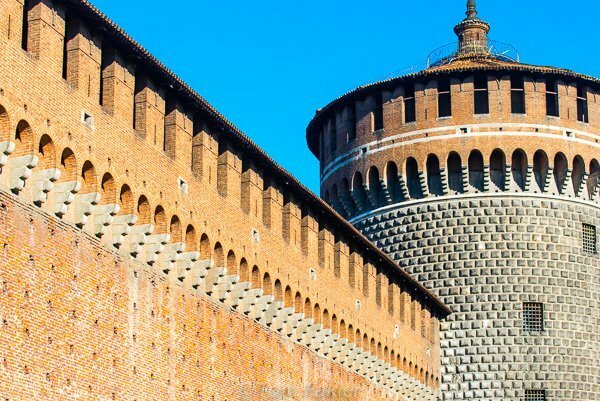 The main entrance to Sforza Castle is through the gate beneath the Filarete Tower. 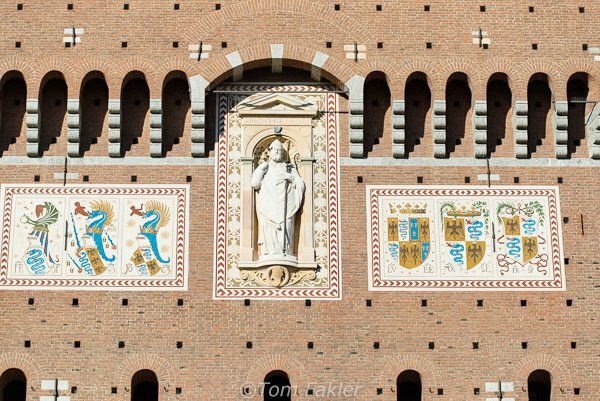 A statue of St. Ambrose, patron saint of Milan, decorates the Filarete Tower of Sforza Castle, flanked by the Visconti and Sforza coat of arms, a snake/dragon swallowing a person and black imperial eagle. 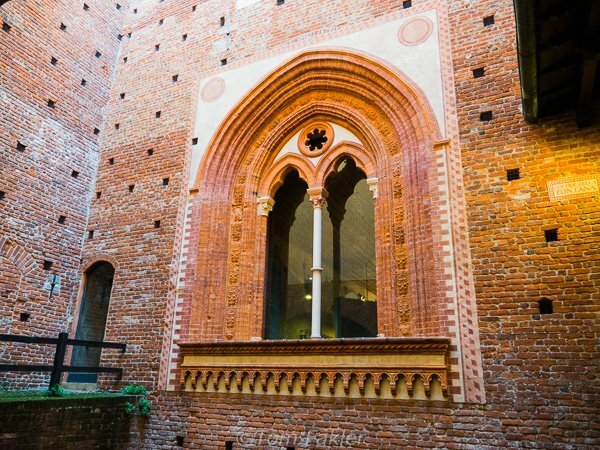 Elements of Islamic-styled architecture can be found at various places in Castle Sforza. 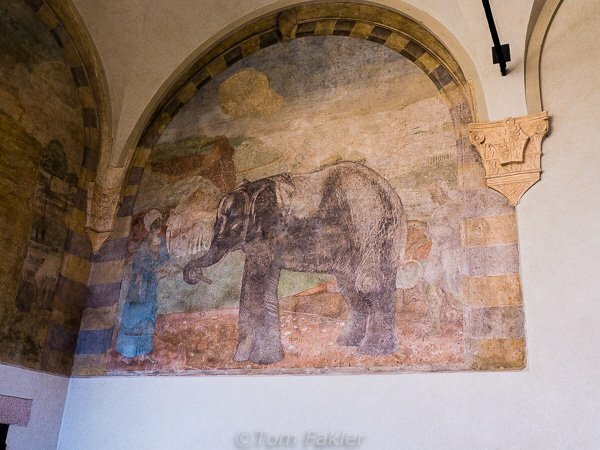 The Loggiato dell’Elefante, with its faded elephant fresco, fronts the original ducal residence wing of Sforza Castle. 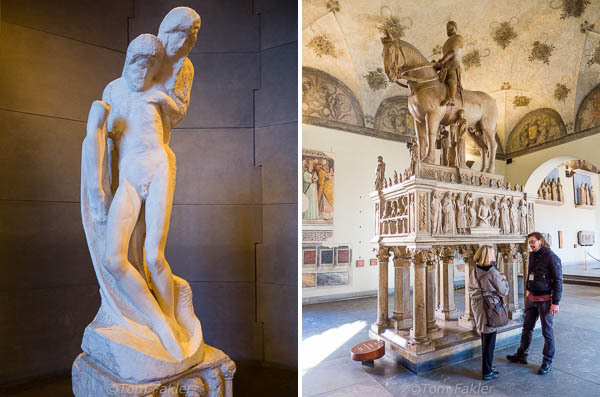 Two striking works in Milan’s Museum of Ancient Art: Michaelangelo’s last, uncompleted Rondanini Pietà in marble; and the monumental sepulchre of Bernabò Visconti, built to reinforce in death the power he had wielded in life (it did not serve him well, he was poisoned by his nephew). On our brief visit, we also saw the Sala delle Asse, with its elaborate, badly damaged, fresco by Leonardo da Vinci. The restoration is expected to be completed in time for Milan’s Expo 2015. Our guide for the day was Ludovic Goudin, who far exceeded our expectations. Amiable, informed and energetic, Ludovic packed a day’s worth of detail into three short hours. 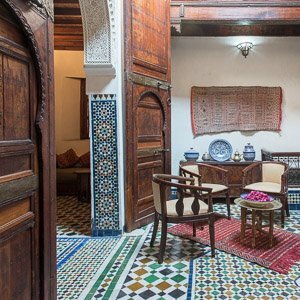 Our guide kept the itinerary manageable–just–and readily answered every question we came up with. Best of all, Ludovic introduced an unexpected element of drama between the worlds of church and castle: San Maurizio, a frescoed marvel of a convent I’ve not found in any of my guidebooks. Every guide should have such a great “secret destination” at the ready for art fanciers, like me. Thank you, Ludovic! 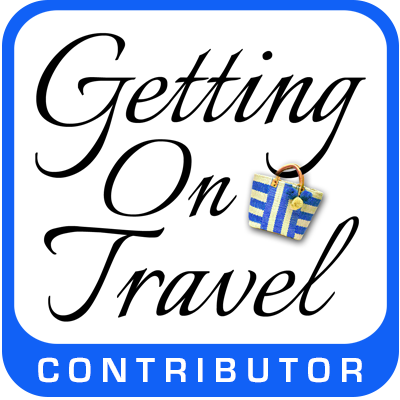 My husband and I were the happy guests of Walks of Italy, who offer tours of Milan and other cities, as well as a range of walking, cooking and wine tours across Italy. 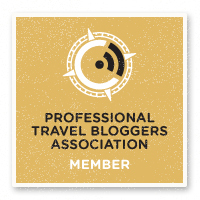 We look forward to future explorations with the dynamic guides of Walks of Italy! I have never seen Turin, Italy. I traveled to Europa many years ago, when the Euro was not introduced. Just reading your many articles on Turin, never realized how beautiful it is.